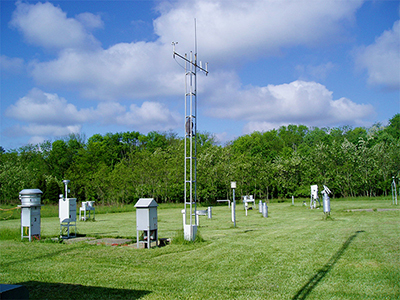 Since 1979 the Ecology Research Center has been a site where weather and atmospheric chemistry data are recorded. Today, this weather station is managed by the Institute for the Environment & Sustainability (IES) as part of its public outreach and monitoring mission. Daily and weekly monitoring by IES students and staff is funded by several national agencies (U.S. Geological Survey and the U.S. Environmental Protection Agency) and serves the needs of the National Atmospheric Deposition Program/National Trends Network (precipitation chemistry) and the National Oceanic and Atmospheric Administration's (NOAA) U.S. Weather Service. Other data collected include ozone monitoring, dry deposition chemistry, solar radiation, temperature, and precipitation. For more information about this station, contact Dr. Jonathan Levy (levyj@MiamiOH.edu) at the Institute for the Environment and Sustainability. Please contact us for more information regarding the availability of the meteorological data collected at the Ecology Research Center.